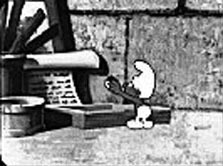 I was originally going to make this thread dedicated to the lesser-known animated series "Les Schtroumpfs" (The Smurfs) from the 1961 which was the first animated series starring the Smurfs. But I figured, it would be better to create this thread dedicated to the even lesser-known TV Special "The Smurfette" (La Schtroumpfette) since there's very little information I can find behind the special. Before I get to the main topic, I want to give a brief history behind 1961 series. Years before the Hannah-Barbara animated series starring The Smurfs was created in 1981. 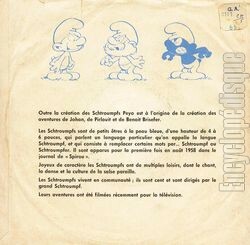 The first animated series starring The Smurfs was in 1961 called "Les Schtroumpfs" (The French name) which started production in 1959 and was produced by TVA Dupuis. The series aired on RTB (Radio Télévision Belge de la Communauté Française) from 1961 to 1967 with a total of 9 episodes. Belgian Comic Strip Center in Brussels, Belgium which is the series's native country. 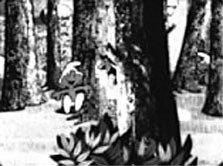 According to a French website, the same producer TVA Dupuis made a TV Special which adapted Peyo's comic story "The Smurfette" (La Schtroumpfette) which marked Smurfette's first animated appearance in 1969. Unlike the 1961 series, very little is known about the production history with no existing screenshots available and apparently aired once in Belgium. 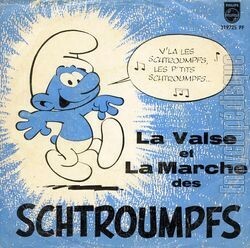 The only thing related to the 1961 animated series that ever gotten released was a soundtrack album called "La valse et la marche des schtroumpfs" which was released in France and Belgium in 1965. The album is also very rare to find today. German website for the 1960's series and 1965 film. Wow, I can't even find any mention of it anywhere! I have no idea where to start with this search. Considering all the original series was first broadcasted on the channel "Radio Télévision Belge de la Communauté Française" (RTBF) I'm assuming that's where it was aired, they may have a copy? 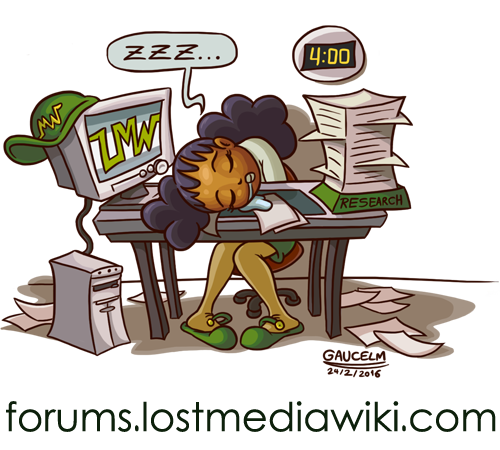 If not, the more likely candidate is their publishing company Dupuis. 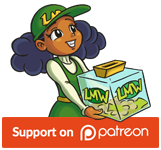 The smurf wiki is saying that Belgian Comic Strip Center has all supposedly viewable episodes of the show and "parts of the movie" yet there is no mention of the smurfette tv special in that. The only mention of the special in the wiki at all is in the see also of the television series page with no article simply stating "The Smurfette (TV special), a 1969 Smurfs TV special made by the same producer"
I find it so odd how they have all the episodes but only parts of the movie and no smurfette special? 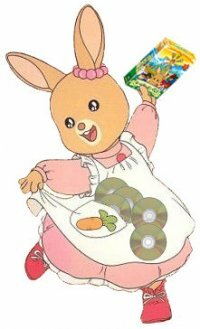 I wonder how bad television show preservation was back then? I recently stumbled upon a video from the official French Youtube channel for The Smurfs (Les Schtroumpfs) in honor of the franchise's 60th Anniversary of this year which contained a clip from one of the episodes from the 1960's. Judging by how good the quality is, I think they still might have that obscure Smurfette TV Special somewhere. Bluebuddies.com (A forum and fansite dedicated to The Smurfs franchise) would be interested about this forgotten Smurfs special. I didn't know there was another Smurfs cartoon besides the 80's one and The Magic Flute movie! Yeah the 1961 series actually predated the Hannah-Barbera series and the 1975 animated film. The 1960's animated series and the 1969 TV Special faded into obscurity due to the success of the 1980's show. I looked it up on World Cat and the only thing that isnt a book is called "Deux histoires de Schtroumpfs Texte imprimé la schtroumpfette et la faim des schtroumpfs"
I think that's one of the older prints of the comic story. Well at least there's more screenshots of the 1961 series.